Only problem is the pedals are slightly misaligned causing a clicking feel and sound as you pedal. Awesome product! I have the 12' and I just love it! Awesome workout! Worth every penny!! They are a blast and great workout! Q: My husband is 300 lbs. What is the weight capacity? One website shows 225 and one shows 275? Thank you. A: The 12' has a capacity of 275 lbs. and the 10.5' has a capacity of 225 lbs. Q: Can this be used in the ocean? A: We appreciate the question! Yes, this can be used in the ocean. Q: How does the handlebar attach/detach? Is the mounting location a "handle" on the board when the handlebar is detached? A: The handle bar is inserted into the paddle board, attached to the steering function, and secured in place by a twist latch. To remove, simply detach the steering, undo the twist latch and take the handlebar out. A mounting location is not provided on the board. 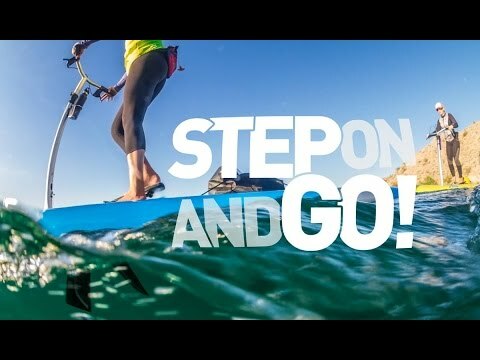 Q: In one of your pictures it looks like their using it as a regular paddleboard. Is that true that you can use it either way if you choose? A: it can be used as a regular paddle board, but the mirage drive is what makes this special, it also will not be able to have as good of tracking without the pedal drive in. Q: Does it come with a cover and wheel cart? If not, I don't see on your website where to order them. Also, is there an odometer on the handlebars? A: It does not come with a cover and cart, however they are available. 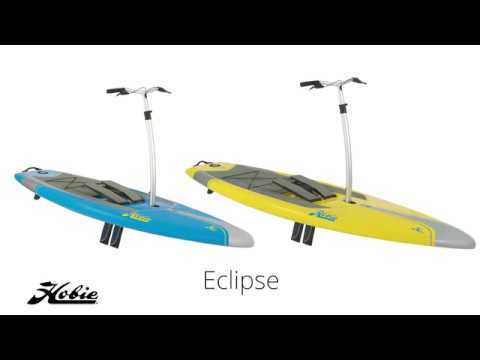 The cart for the Eclipse's are the standard i-series cart from Hobie, and the the covers are available for both lengths. $165.00 for the 10'6" and $175.00 for the 12'. I am sure customer service would be able to help you get covers if you were interested. As far as an odometer, no one does not come on the board and I don't think there is one currently available. Q: How does this handle in short chop and rough water? A: This is specific to the individual based upon your balance and center of gravity. Q: I have a 44 lb. dog which I currently take on my SUP. Would the 10 ft. board accommodate him? Or do you think the 12 ft. I'm not sure about the distance behind the pedals of either board. Thank You. A: We would suggest the 12' board simply because it has more room, stability and weight capacity for you and your dog. Q: What is the height of the handlebar? A: The handlebar adjusts from 36 to 43 inches in height to accommodate riders from children to tall adults. Q: Is the handle height adjustable? A: We notify customers by email when their Pre-orders are ready to ship. 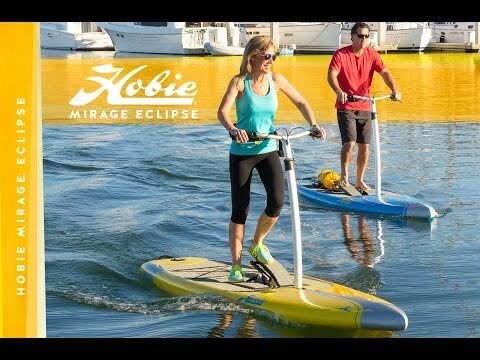 Q: When will you begin selling the Hobie Mirage Eclipse 12 Stand Up Paddleboard SUP? Thanks!